Trying out a new lens – the Canon EF17-40mm F4L USM – Oh boy – feels substantial. Not so fast, but should help sharpen up things. The photo above is of a loft project underway – at least the demo part of it. I believe there is quite a bit of potential for this place – but that depends (in my opinion) on the insertion of the new against the old. It’s a delicate balance to realise the moments of character that exist that give a place its feel and to graft onto that something completely new. The trick is to find the contrasts I believe – so that each is read stronger against the other. Partly what I’m realizing is that the photograph is a way stepping back and seeing what is there. 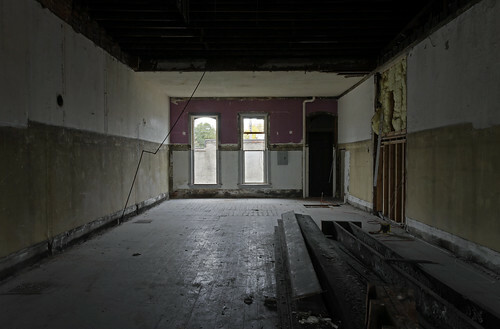 For this place – I like the quality of light and the character found at the end walls. More to come on this place I’m sure. This entry was posted in Interiors, Matt Niebuhr - Photography and tagged ( Matt Niebuhr - Works ) by Matt Niebuhr - West Branch Studio. Bookmark the permalink.